As soon as I finished my Seneca sweater, I knew what sweater I wanted to cast on next: Cassis. I’d been seeing this one around Ravelry for a while and after seeing a number of people knit this, I knew I needed one of my own. One of my goals with knitting 12 sweaters this year is to primarily use stash, so the first thing I did was go stash hunting to see if I had something appropriate for it. The Knit Picks CotLin I bought with the intention of making Jali (then decided the cables didn’t work with the yarn) came to mind and I even had a swatch already knit from my Jali attempt that had the exact right gauge! Seemed like a perfect fit and I cast on as soon as I had Seneca blocking. I started this February 26th and I’m well into the body. I decided I’m going to make this with longer sleeves and I’m adding waist shaping. I debated about sizing since I’m between the 42″ and 44″ sizes, but went with the 42″ size. Since the fronts are meant to overlap by about 2″ and I don’t plan on wearing it closed all the time, I think it will fit me better overall this way. I was on the fence for a while with how I felt about the Textured Shawl I’d started in Malabrigo. Ultimately I decided I didn’t want another triangle shawl and the textured pattern (while nice) was annoying to knit for me. I just had this feeling I wouldn’t wear it much, so I frogged it. After frogging, I went in search of another pattern for this yarn. It was calling me to make it into something, so after some searching I decided to knit Saroyan. I started this on February 27th, but after a week and a half of working on it I found that I’d not read the directions properly and did the increases wrong (they aren’t done on row 3 and 11 of the pattern repeat). I realized this on March 10th when I reached the point where I would work straight. I waited a day to decide what to do since it was late at night when I realized my error. The next day, I frogged it and started over. I’ve worked on it non-stop since then and I’m three repeats away from finishing it! 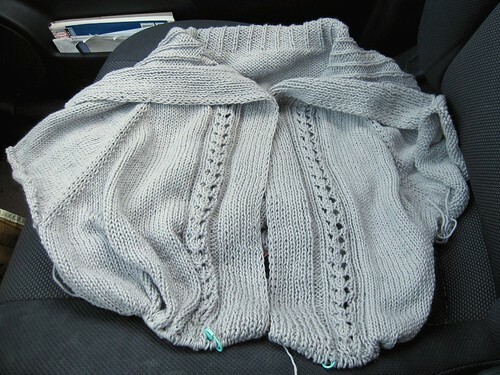 I should be able to finish it tonight and get it blocking. 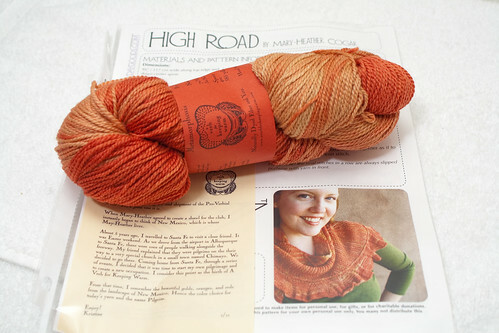 I’ve already got my eye on the next project I want to knit once it’s finished: High Road. This is from A Verb for Keeping Warm’s 2nd shipment. 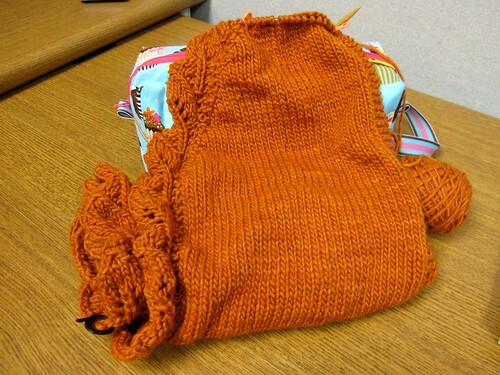 I’ve wanted to knit this since I got it. The construction is interesting and I love the color of the yarn. It’ll be a good project to work on when I can’t work on Cassis since that sweater is getting rather large and hard to cart around easily. I’ve been doing a lot more project planning lately then is usual for me, but that’s not such a bad thing. Sometimes I feel at a loss for what to knit and other times I just know what I want to work on. Just the way things go sometimes! Oh hai! you’re here already mentioning your DC trip. I’m sorry!